Is there an empty mSATA slot for adding an mSATA SSD hard drive? I want to keep both the 1TB and optical drive. What kind of battery life are you seeing? 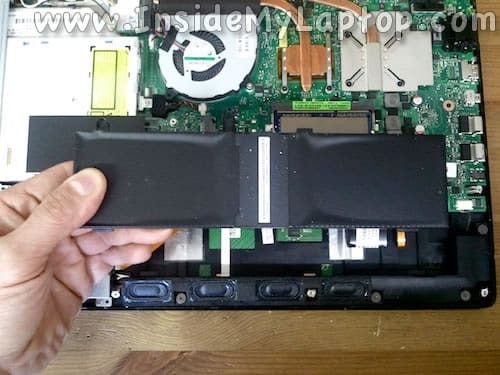 Yes, this laptop has a empty mSATA slot. You can see this slot in the step 3, right under the fan. It’s marked SSD (cannot see that on the picture). Not sure about the battery life because it wasn’t my laptop. I was fixing that for my customer. Thanks for the tip on the extra mSATA slot for an SSD! I was wondering about that as well. Does the mSATA slot have adequate room for a full size mSATA or would this machine require a mini mSATA drive? I just added a picture at the end of the guide. I believe that only a mSATA Mini (Half Size) SSD can be installed. On the picture you can see the SSD mounting stud and I think it’s designed for a mini card. Thanks for the update and pic. I just ordered one of these laptops this morning, so if I have any success cramming a full size mSATA in there I will post back. Search on eBay for “ASUS Q550LF HDD Caddy” and you’ll find it. 2nd SATA Hard Drive Caddy Adapter cost about $12. Anyone have experience with the msata? Just purchased the HDD caddy and installed my old 830 to replace the 1tb 5400. Also anyone know power diff in terms of consumption when 2 HDDS? 3? Yes I have the Msata slot with a full size msata ssd 240gb Crucial from amazon, it works like a charm it does angle a lil bit but it sits will under the blacktape and the bezel. Do you know the location to clear bios on this this model? I search everywhere but don’t seen to find the answer. Sorry cannot help with this. I don’t know how to do it on this model and couldn’t find either. 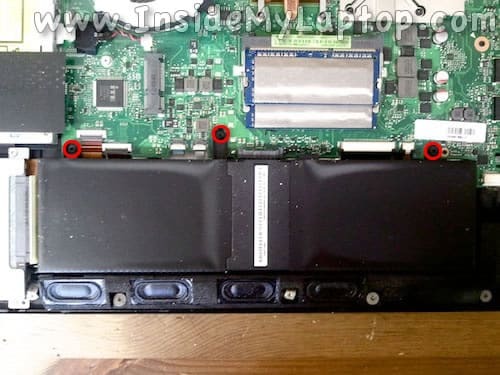 How have the ebay caddys worked on this laptop? I read that they require the original Asus bezel to be moved to the caddy, or there will be a gaping opening left. No bezel comes with the caddy, I guess. Also, has anyone been able to install any mSATA drives. Did you leave your 1TB and DVD in as well? if so, did the BIOS find it automatically, or did you have to find a setting in the BIOS to recognize it? The BIOS in this laptop is pretty primitive when it comes to settings. Thanks for any help with this. Does anyone know’s what kind of RAM memory is this? i know its DDR3 but the model? PC2800? 3200?… because i want to buy another card to pair the original so i can have 16 GB… thanks for your help in advance. I believe it’s DDR3 PC3-12800 1600MHz but double check just in case. Anyone had issues with this laptop not recognizing an SSD in a HDD caddy? I booted to BIOS after installing a 240GB M500 SSD in a 9.5mm HDD caddy I purchased from eBay (bezel fit right on after aligning clips) anyways BIOS doesn’t recognize the drive. Any ideas? I gotta crack it open again and check connections, but if that doesn’t work maybe I’ll try swapping the 1TB drive into the caddy and put the SSD in it’s place. I am on BIOS version 212 I believe. Any help or insight from personal experience would be greatly appreciated. maybe I’ll try swapping the 1TB drive into the caddy and put the SSD in it’s place. I think that’s a good idea. This will allow you to figure out if the caddy or SSD is defective. Have you tried loading default settings in the BIOS? Alright, so I swapped the HDD and SSD and this time when I booted into BIOS it detected the SATA 1 port, but it read as empty, before with the SSD in the caddy nothing came up at all. I started fiddling with the boot options and disabled secure boot and enabled Launch CSM and it showed the info for the HDD under SATA 1 port in config. I think I’m going to have to swap them back around, but any idea what Launch CSM is? The BIOS are not very friendly in terms of options and are fairly restrictive with boot options, making this whole process more difficult than it needs to be. what is the for the six head screws on the outside bottom. I got a full-size mSATA SSD (SanDisk X110) to sit on the motherboard. It certainly does not sit flush, but a little angling and tape secures it. It works perfectly as my boot drive. what is the part number for the torx screws on the bottom? 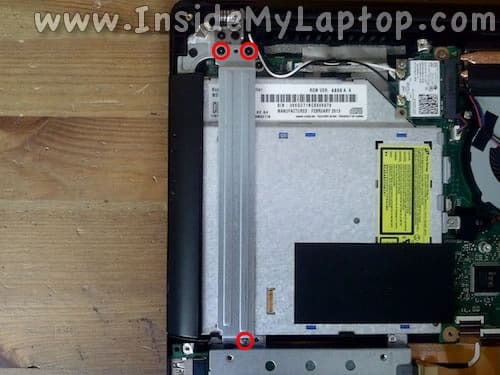 Hi I have been doing some research on how to upgrade to a ssd on this laptop and this is by far the best site I have seen yet thank you for posting this. But I am a noob when comes to upgrading things on computers my question is, is it easy enough for someone who has never upgraded any thing before to replace the HDD with a SDD? also how do I go about upgrading to 16gbs of ram? and again thank you for this page lol. I have two of these laptops. They have differing hardware. One has an Intel N7260 Dual band WLAN card and the other has Qualcomm Atheros single band . One had a Toshiba HDD the other had a Samsung/Seagate. (both 5400rpm). Unfortunately, one of the laptops had a defective headphone jack right out of the box. Sending it back seems like a big hassle, so I’ll just use a USB headphone adapter on that one, I am still completely stymied by the BIOS of these machines. Trying to figure boot order, or how to add a second drive seems a major PIA. The ASUS manual is not helpful at all. @Nick, you’ll need a T5 driver (Wiha #96705 or similar) to remove the bottom case housing. When working inside the laptop you’ll want a Philips #0 and Philips #00. Can you tell me where the Nvidia Graphics card is? The graphics card built into the motherboard. It cannot be removed or replaced. my question is, is it easy enough for someone who has never upgraded any thing before to replace the HDD with a SDD? also how do I go about upgrading to 16gbs of ram? 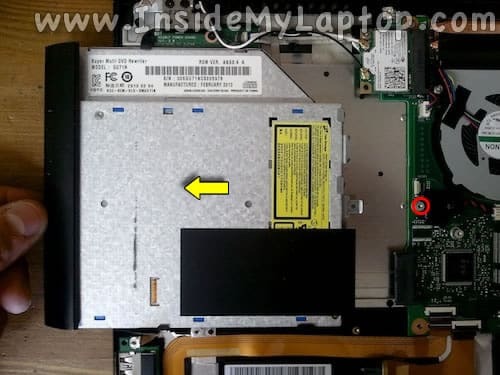 In order to replace the HDD with a SSD you’ll have to remove the bottom cover, disconnect the HDD and install a SSD instead. It’s not that difficult. Installing OS on the new SSD will be more complicated. You can try cloying the old HDD to the new SSD using EaseUS Disk Copy (free for home use) software. RAM upgrade is easy. You remove old RAM and replace it with new. Check out comment #22. I guess you can secure the full size mSATA with tape. Could you tell me the msata of Q550LF is sata2 or sata3? Thank you! Hi, i just bought Corsair 16GB SO-DIMM 1600 MHz DDR3 SDRAM Memory PC3-12800 (DDR3-1600) but my laptop refuses to boot. Does anyone have a solution to my problem? haha i checked , did a little research and this is the exact speed, model and capacity my Asus Q550LF accepts. So, i dont know whats the problem! It’s not likely but possible that one of new RAM modules is defective. First of all, try reseating both RAM modules. 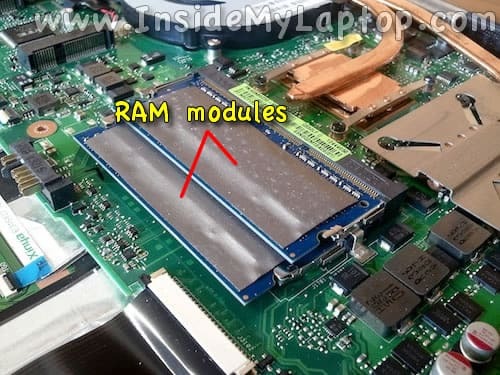 Maybe it’s just not connected properly and test the laptop with both modules installed. 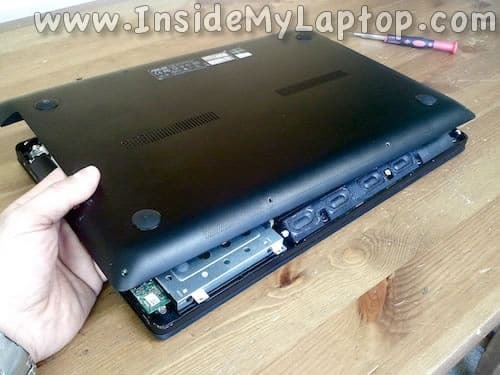 If it doesn’t work, try removing them one by one and test the laptop with only one module. Try different slots. I also had the same issue with getting RAM to be compatible, I have G-Skill 8GB DDR3 1333. Can’t get it to boot, I have 2 sets brand new. Is it possible to replace the DVD drive and replace it with a bluray drive easily? will the computer boot up? Is it necessary to remove the battery first before you upgrade? Online I looked up how many RAM slots this had and it said 4, but when I opened it up it only has two…. I already ordered more RAM so I will have to take out one of the cards…, but is it correct that it only has 2 slots?? What kind/size of screws does this have? It appears to be Torx, but I can’t quite tell, nor do I know the size. Hey guys… 8 month owner of the Q550 here. I have lots of info. @ Vector,Ben, and AsusNewb… In the past RAM for most laptops has been rated at 1.5. volts. However, with the Haswell line of processors computers are able to be more power efficient, and laptops with Haswell boast better battery life. With that said, almost ALL Haswell laptop memory runs 1.35V, and the Q550 is PC3-12800. 2 slots, 8GB stick in each. Frequency needs to be 1600MHz/1.6GHz. Just make sure to ORDER 1.35V. You will not be able to find this memory in Best Buy so unless you have a Tiger Direct or Frye’s near you then you must order the RAM sticks online. @ Andrew… Most computers are meant to have replaceable/upgradeable processors. The Q550 is no exception. 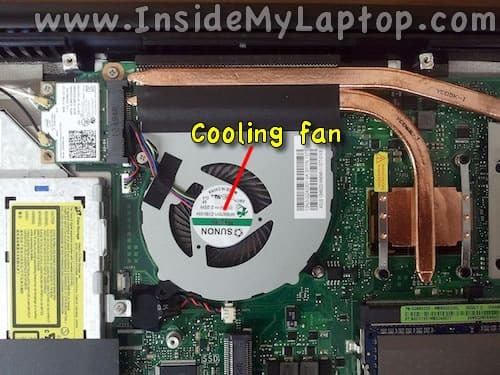 You have to remove most of the guts in the laptop, and the processor is located DIRECTLY under the cooling fan. You have to pull pretty hard at the fan to get the solder to break off, but the processor will be sitting, locked, right underneath the fan. All you have to do is pull the lock in the unlock position and pull the processor straight up. I have not looked into the motherboard of the Q550 to see what processors are compatible, but I would go with the 4700MQ or 4600HQ if I were you. Hope my info helps somebody. I don’t remember off the top of my head. Probably torx T5 screwdriver. @nightsun, to #33, As I know is SATA3.thanks . Wait wait wait……the cpu is upgradable?! I believe the CPU is NOT upgradable. It’s soldered to the motherboard. Hey, its posible to turn on this lap with the battery removed using only the ac charger? (like almost all the laptops). I usually remove my battery when Im at home, I just use the ac charger, I do this to give a longer life to my battery. 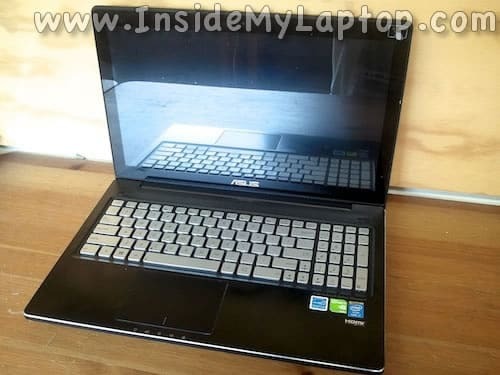 I liked this asus and want to buy it but I hated the fact its battery its internal. 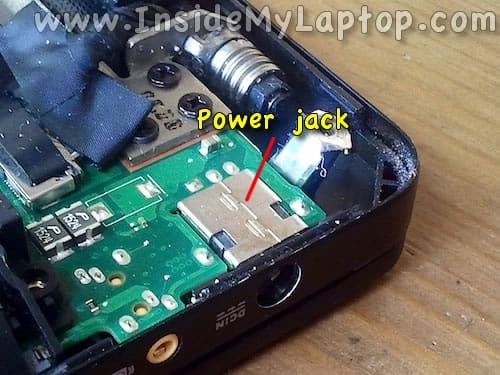 its posible to turn on this lap with the battery removed using only the ac charger? (like almost all the laptops). I usually remove my battery when Im at home, I just use the ac charger, I do this to give a longer life to my battery. It is possible but in order to disconnect the battery you’ll have to remove the bottom cover. Just use it as is without disconnecting the battery. I noticed that there are about three comments on here about fixing or replacing the screen that have not been fallowed up on. If there’s an answer to taking this apart or taking the whole thing of i would like to know. as well as where to find another screen that has touch capabilities as i have not found one of those just the LED once. If this is to big of a project of expensive i would also like to know that so i cant drop my search and move on. Just thought I’d mention that based on this article, I ordered a MSATA, and once it arrived, I removed the bottom cover on my Q55LF, but I did NOT have a MSATA slot. I have little solder points where one would go if it was like the one above, but the plug itself wasn’t there. So it appears that not all of these laptop have this option available. Could you tell me the full model name of your computer? Similar to other Asus Ultrabooks, I’m thinking the newer revision model (T21) of this notebook does not have an mSATA slot. Instead it comes with the better wireless card and Windows 8.1 pre-installed. I haven’t tried replacing the screen yet but I’m sure it will not be easy. It looks like the glass it glued and has to be removed the same way as on a MacBook Pro. 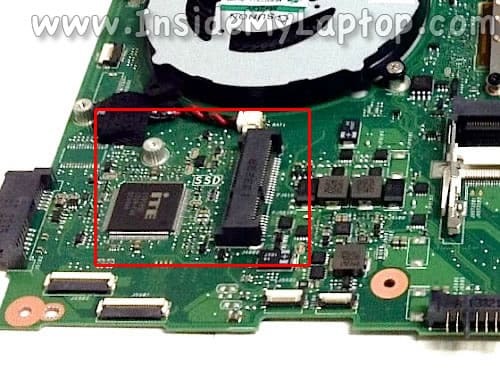 Does anyone know what the Motherboard is and a Version of chip-set drivers that will work with Win 7? 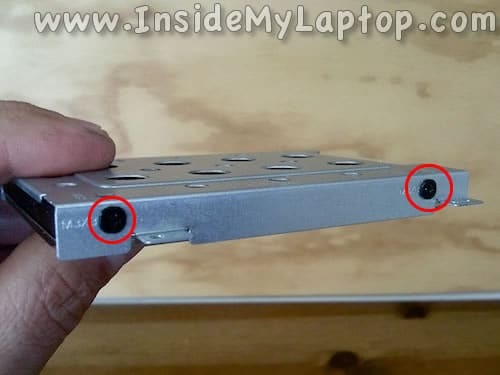 Hi All – trying to replace the display HINGE COVER on a Q550L – usually these things just kind of snap in, but this one looks like it’s got a slide-in from the left type deal….anyone have experience with this? Do I have to remove the bottom cover to get room for the slide-in deal? @Don, #60. Hi my laptop feel and my bed to the carpet floor the and hinge cover with some of its tab broke off. So yeah I believe it slides from left to right and if you slide it from right to left should jut be able to lift it off. I don’t guarantee so be extra careful if you try anything. There’s no need to remove it unless you are changing the hinges or replacing LCD screen. I tried looking for a replacement hinge cover but none is found online. You know some place I can find a replacement? I have looked at ebay and found one but looks very used w/ broken tabs. The CPU and graphic card are soldered on or glued on. I saw what look like some kind of clue around the chips so don’t bother thinking about upgrading or changing those. I have noticed that if you use windows 7 with it. Waking up from sleep from time to time the wifi sometimes does not work. To fix it just restart or right click then repair network. Other than that windows 7 seems to be working fine. I have an issue with my asus Q550lf. It doesnt start anymore at all, no activity whatsoever. Hey I appreciate your work on giving a tutorial about how to repair laptop. It would be great if you could get a Youtube Channel of your own and show videos. I’ve noticed mine has been running slow lately and am worried the hard drive might be donking out, so I’d like to replace it with a 1tb SSD. Could you recommend one? I’m terrible at finding parts. Also, is it possible to upgrade the GPU? RAM? Would it be a good idea to replace either? I enjoy serious gaming and programming on mine while at college. I’d like to replace it with a 1tb SSD. Could you recommend one? Samsung 850 Evo SSD probably would be a good choice. Also, is it possible to upgrade the GPU? RAM? Would it be a good idea to replace either? You cannot replace the GPU, it’s built into the motherboard. Yes, you can upgrade RAM. According to Crucial, Asus Q550LF will support 16GB (up to 8GB module in each slot). If you like gaming, you need more RAM. I had a Q550LF and was too slow becouse the disk, i decide to change the primary disk for a Crucial Bx100 500gb ssd. But the problem was when i tried to make the new installation, first the disk was recognized by the bios (v211) fine but when the windows setup started it didnt find any disk. After hours of reading, i just go with the upgrade of the BIOS from v211 to v215, and now it recognized the disk and it is installing windows fine. Also to see any boot device i had to disable the safe boot option, disable the fast boot and enable the Launch CSM. Where is the NVIDIA graphics card? Liquid was spilled by the number pad but was quickly cleaned up and dried it the best I could. The computer works fine but the keyboard has been bugging out ever since. For example, sometimes it is as if the enter key is stuck. The touch pad works but clicking is disabled for a couple of seconds and then goes back to normal. Does this mean that I have to replace the keyboard? If so, is the keyboard easily accessible? 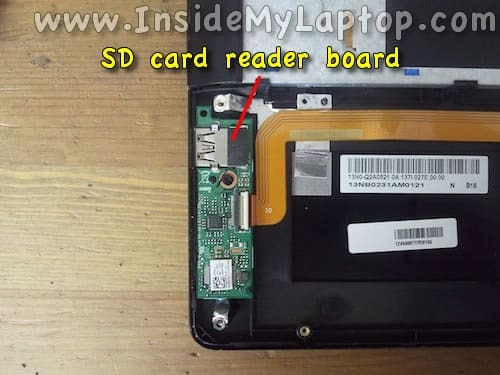 hi.. i have the asus q550lf- i want to upgrade thre hhd, but remove the optical drive.. i want to instal ssd or sshd, but the question is the capacity can support this laptop. 2tb support…. Como faço para resetar a bios do notebook, pois coloquei uma senha e sempre que reinicia tenho que estar colocando… Desde já agradeço. Anyone with better Info or links to parts on the screen replacement for q550lf woulkd be greatly appreciated. I went to throw in a crucial 500gb ssd to replace the hdd, but my backing will not come off and I’m afraid to push it anymore for fear of it breaking. Is there a trick to getting the cover off, or am I needlessly worrying about damaging components by forcing it a little bit? Can anyone link me to a good compatible SSD to use in place of the HDD, a good compatible msata SSD to add and good ram sticks to use? I want to upgrade the Hdd, add an msata ssd and replace the ram with more heavy ones all in one shot. That way I can save on shipping and time. Also has anyone tried using Gentoo Linux with this laptop? I’m planning on running Windows off the Ssd and gentoo off the msata ssd giving me dual boot capabilities? Is this a good idea? Most likely the buttons are full of dust. You should always have a can of air around and regularly blast your laptop and other components inside and out. The early Q550 had keyboard problems coming off the assembly line, with the space bar a particularly annoying problem. The keyboard and the headphone jack resulted in many returns and refurbishings. Replacing chiclet keyboards on an asus is annoying because they are usually pinned to the bottom of the keyboard housing with glue, melted plastic “rivets” or some other permanent method. I’ve done a keyboard replacement on an asus and had to break all the rivets to remove the bad keyboard. After that, I had to find a way to create the counter pressure necessary to keep the replacement keyboard poking up through the housing using plastic scraps and glue on top of the dvd-rom. (The key labels had worn off the old keyboard so we couldn’t see which key was which. We felt it had to be replaced.) In retrospect, since the asus sits on a desk, an external keyboard would have been a quicker, more satisfactory and less frustrating solution. I have had this laptop for about two years now. I love it, except for the slow 5400 rpm drive. With the windows 10 upgrade coming soon, I feel now is the time to install an SSD. Would you recommend replacing the HDD with the SSD or installing a mSATA SSD or mini mSATA SSD? Awesome tutorial! One question, I know the screws for the back are t5 torx screws, however I stripped some of the heads off of them and was wanting to know what are the screws themselves? Where can I buy replacement screws for the back? Thanks everyone!! Your page has been a great help! Thanks! I’m scouring the boards to see if anyone else had my experience recently. My Q550LF-BBI7T07 just died. The part which is curious is that all 3 of the drives inside died as well. All data gone. When I press the power button, all the lights come on, hd accesses for just a second. Nothing comes up on the screen. I cannot enter the BIOS because it appears the screen is dead. I have tried reviving the drives as slaves using other computers but show as “unallocated” space. They were all protected by bitlocker but the bitlocker repair tool does not recognize them. I’m guessing that either the chipset or cpu/gpu combo got fried? Another poster mentioned the nvidia card. I know the intel gpu is built into the cpu but does anyone know where the dedicated nvidia gpu is located and whether it is replaceable? I am also having problems with the keyboard. Like Abbas said, the z, b, n, left shift/alt/ctrl and space bar, as well as the arrow keys and enter key, are buggy. The strangest part is that if I tilt my computer in different orientations, the keyboard will work fine. Like, right now, it is working fine. I have it resting on my lap at a traditional 90 degree angle. However, if I bend the screen to more of a 45 degree angle and propped it up so that the spine is resting on my lap, the keys don’t work anymore. This, to me, means the keyboard is disconnecting from the motherboard in some way. Does the keyboard have a specific connection that may be loose and disconnecting/reconnecting as I change the angle of the screen? I had an issue with the keyboard on my Q550lf. The c, 1, 2 and 3 keys were intermittent at first. Then stopped working for good. I checked the keyboard ribbon to see if it was loose. You have to remove the battery to see the whole ribbon. I noticed that the ribbon is folded under the battery and looked crimped to me. I flatten the ribbon (with my finger).I adjusted the ribbon so it wasn’t folded (crimped) as before and reinstalled the battery. That was three months ago and all the keys are now working. I am experiencing an issue with the speakers on my Asus Q550LF-BSI7T21 (purchased from Best Buy). They do function, but almost any time I play sound through them, they will not begin playback until several seconds after I initiated playback, until the volume reaches a certain threshold, or until they are prompted to begin playing some other way – I’ve found that Windows sounds tend to break through the barrier and play immediately, which causes the speakers to kick in and start playing. For example, if I start playback on a song (or YouTube video, etc. ), no sound will come through the speakers at first, but if I modify the “System Sounds” volume bar and prompt Windows to play a noise, the speakers will begin playing everything as if they had just turned on. Sometimes simply waiting for some period of time works as well, and sometimes raising the volume of the source over a certain level will cause playback to begin, but this is not as reliable as prompting a Windows sound. The issue occurs across many applications, from audio players to internet browsers, and is specific to the speakers – headphones work fine. I have tried reinstalling the audio drivers at least twice, and restored the BIOS at the instruction of an Asus Support representative, to no avail. I’ve even recently updated to Windows 10 and no luck. Any ideas would be much appreciated! Thank you! CHANGE YOUR THERMAL COMPOUND! CHANGE YOUR THERMAL COMPOUND! This is computer gets automatically overclocked frequently and as so will heatsink up. Also like many pc manufacturers they use a cheap generic thermal compound. After a years use of my lappy I started to overheat and radiate thru the keyboard. Cleaned the dried up stock compound off the processors and used artic silver. Hasn’t overheated at all even when using heavy CAD programs. Also as a recommended mod the fan has no direct acess to the vents. It is supposed to pull in air from the bottom vents but due to the laptops low clearance it has trouble breathing thru these vents even when on flat surfaces. Instead it pulls air from the front speaker grill and thru the cracks where the ports are and where the bottom case meets the rest of the chassis. Here are some pics. Note how the dust accumalates on the pan clearly showing the route air must take. The Intel and its gpu is all one chip. It is under the small single copper heatsink. You’ll find two “chips” on one base. The nvidia gpu is under the copper aluminum heatsink combo. I couldn’t tell if they were glued or straight up soldered to the board. I did notice some excess epoxy from underneath the nvidia chip. This issued was fixed on my machine when I got an Asus update a month ago. I believe the realtek audio driver is faulty as I also have issues with the audio on Gentoo Linux. Also has anyone done any cosmetic mods to this laptop. 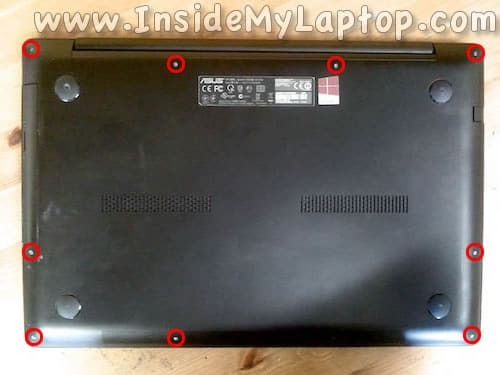 Yea it’s pretty slick and it doesn’t really need any but I was thinking of maybe running some EL wire or some less where the speakers are so it casts a glow to the front from inside the laptop. Also I’m trying to pry the subwoofer open but it seems to be glued together. Hopefully I’ll get some white leds to jump to the bass. how much is the maximum HDD capacity? I can change it for 2 tb? read it? 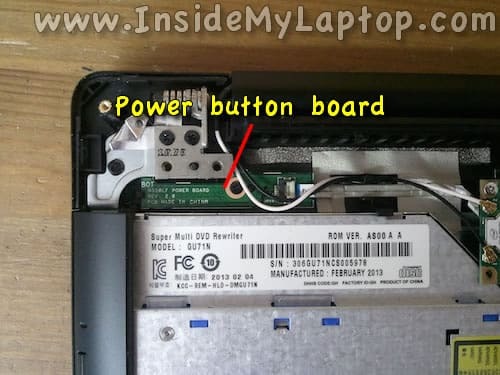 The issue with ASUS q550lf keyboard keys b n space enter shift not working can be fixed by adjusting the keyboard ribbon which is right under the battery. I lifted the battery and put the ribbon over it. Now the keys work. Looks like the ribbon was bent. Bad design. How does one get to the LVDS cable? I have the pink and green screen issue and need to check to check the cable. Is there a fuse on this Asus model! The other night I was repairing my audio jack. When I was putting the computer back together, I forgot about the battery! So as I attached the screen plug to the motherboard, it sparked! Now the screen doesn’t turn on! Hdmi to the tv is cool but I need a screen for mobility. I pulled the screen apart and took a fine look at all cables and ports. Everything is conducting electricity so the problem I’m guessing lays with the motherboard. So as I looked up info, some newer model computers are being equipped with an easy access fuse. Is this Asus also one of those designs or is there more to it? I have the Q550LF-BBI7T07 with the 8GB RAM and the CPU can’t keep up. You say the CPU can’t be ugpraded, so what’s the point in upgrading the RAM? I have been using my Q550 for almost year now. When i was on-board ship( I’m a seaman) i have plug it continuously and lately noticed that the AC power is not indicated although it is plugged in. I have tried to test the output of the power supply with a multimeter and got the right rating. Now my battery is almost drain. Could you please extend some information to keep my laptop back to life? Thank you in advance. Has anyone actually replaced this keyboard? Is it as described above attached with some plastic rivets or can it actually be swapped? Thanks for any input. I have a Q550LF-BSI7T21 and it won’t start at first try. I try many times to start it and so it turn on. What can be this problem? I have an Asus Q550LF. When opening screen to a certain position the screen starts flickering. I am sure the cable needs to be replace. Do you have directions on how to replace it and where would be a good place to order the part?